Few books stay with me for long. I read them and give them away. One has stayed on my bookshelf, now for 26 years. That book is Dr. Stephen Bezruchka’s The Pocket Doctor. First published in 1982 by the Mountaineers, this pocket-size reference, now being published at a bit more than 100 pages, is exactly what its title implies. It is a guide to help a traveler cope with illnesses many people in the developing world face daily. You can buy it online from many vendors, like Powell’s Books. 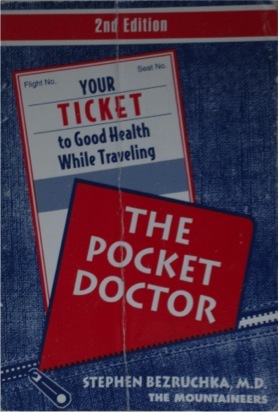 Cover of the second edition, 1988 version of Dr. Stephen Bezruchka’s The Pocket Doctor (personal copy). I credit this book for saving my bacon and mental health on several best-forgotten nights. It helped me cope with medical problems that are normal for hundreds of millions of residents globally, and for me something I did not experience back in the comfort of the United States. But I am not the only writer and traveler who praises Bezruchka and his book. Bezruchka is a Canadian-born former emergency-room doctor trained at some of the nation’s best universities (Standford, Harvard, Johns Hopkins). He has both an MD and MPH. 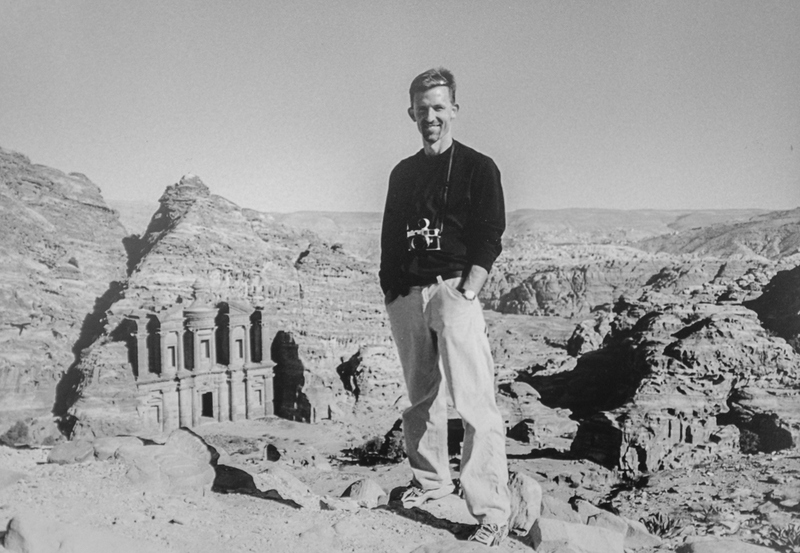 He has worked with medical specialists in the developing world, notably Nepal for 10 years. He also has written a great guide called Trekking in Nepal, which I used back in 1989. Today he is a lecturer on global health at the University of Washington School of Public Health (UW SPH) and a nationally recognized advocate for health care reform to improve public health outcomes and to eliminate health and income inequality. I have taken this book with me now to three continents: Asia, Africa, and South America. I just cannot say goodbye to it, even when my developing-nation jaunts seem fewer and fewer. The advice it provides has helped me to self-diagnose all manners of common gastrointestinal disturbances, such as food poisoning (nasty and scary in a crappy place), dysentery, and common diarrhea. I also used it to help me obtain the necessary medicine for what I still believe was malaria, which I had in Kigali, Rwanda in 1997. With this book in my hand, I felt I could handle the predicaments that afflict visitors from developed countries to less-developed areas. In my 1988 published version, 13 pages are devoted to common drugs and medicines that address typical maladies, such as the antibiotic ciprofloxacin, to tackle infections, with information laid out in a table on a drug’s use, likely place of need (city, remote, “third world”), form, and dosage. Bezruchka’s writing is straightforward and direct. In his chapter on drugs, he begins his recommendation with a simple message: “Remember that drugs, though valuable, are not a cure all.” He provides advice on assembling a medical kit, working with doctors at home and abroad, and dealing with major sources of health problems—namely, food and water. Bezruchka also highlights a major global health issue that is more severe than microbial agents, trauma from vehicle accidents. “Trauma, especially that caused by motor vehicle accidents results in the majority of disability acquired in developed countries,” writes Bezruchka. “This is even more true in third world countries. Trauma causes more disabilities to travelers in foreign countries than all the exotic diseases put together.” That observation remains true to this day, as shown in global health data. Faculty photo of Dr. Stephen Bezruchka, courtesy of the University of Washingston School of Public Health web site. But there is much more. Rabies? Check. Animal attacks? Covered. Ticks and leeches, fever, rashes? All addressed. The two-page section, in my old and battered version, on dealing with stress in less-developed nations is a classic summary of what many first-world travellers experience. Bezruchka even has sections on death and how to cope with returning from travels with an illness. I definitely experienced lingering issues when I came back and took this advice to heart. When I first met Bezruchka in person during my studies at the UW SPH, I mentioned how much I enjoyed his book and used it frequently in Nepal. I even mentioned how enterprising Nepalis had published black-market copies of his book they were peddling on the streets in Kathmandu. As I recall, he considered that a compliment to the value of his work. Sometimes small and perfectly executed creations are ones that have the most impact. In Bezruchka’s case, there is far too much to choose from to say what is best—from published papers to advocacy to mentorship of future health leaders. I will submit this still fine tome as work that stands the test of time and proves that small is often better.